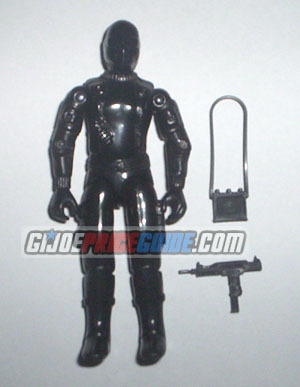 NOTES: The 1983 swivel armed Snake Eyes has a smaller waist than the 1982 straight arm version. It is important to note that the accessories are a dark grey, not black. The figure is completely black. A mint figure will have black painted metal rivets. This figure/character is not necessarily rare, just very popular.